Christmas is over, when’s Payday? We know the deal, you’ve had a great Christmas and Boxing Day. You’ve gone back to work today and checked the bank balance! Maybe you followed the many tips online and your Christmas and it was all paid for in advance. Maybe you didn’t and your bank account is empty. If you’re like most people, it’s two more days until payday and you need some emergency cash! Watch our quick video to find out more and read on for our top 5 tips to make it to payday. It’s old fashioned but there is a good chance there’s enough in your house to feed you for 2 more days. Hopefully you didn’t throw what was left of the turkey. To bulk what’s left up, nip to Tesco or Aldi who are selling veg for under 30p a bag. Do a plate full of roast potatoes and ration the remaining turkey. That will provide another family meal. You’re probably tempted to keep the party spirit alive and keep on going out. Maybe you’ve got in mind that you’ll give up booze in the New Year? It’s been proven that people who start their New Year’s Resolutions early are more likely to succeed. Why not quit now, save the cash for one last drink on New Year’s Eve. As if we need to say it, it’s bad for you anyway. Even if you don’t plan on giving up, try it for the next couple of days. The first couple of days are pretty easy so it’ll be no problem waiting until payday. If you find the next two days easy, why not keep going for as long as you can? Rather than drive over the next couple of days and risk needing a fuel top up, why not walk? It’s great to burn off some of the stodge from Christmas and will make you feel better too. If you need to travel further, try public transport or use a bike if you can. 5. Borrow from the kids! 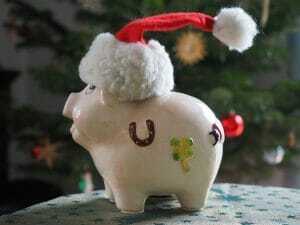 It sounds terrible, but if your kids got Christmas money from relatives, write them an IOU. If they weren’t going to spend it until the weekend anyway, borrow it (with their permissions of course). Make sure you pay it back on payday or risk being on next year’s naughty list!